The Daily Shaft: The Clone Wars as Legitimate War Story? The Clone Wars made its television debut in the unenviable position of having to work out of a deficit. As if the new Star Wars trilogy hadn’t done enough to disillusion the fan base, here came George Lucas with a funny looking 98 minute long commercial for a television series that promised to revel in the crap that had already put fans off the new trilogy. Oh, and it promised to offer “something for the kids”, as well. Great, that’s just what we needed, more of George Lucas talking down to the audience. Still, I gave the show a chance during its first season. I wasn’t thrilled, but I didn’t hate it either. One episode in particular got me thinking that there might be more to the series than the whiz-bang flash that I had seen in Attack of the Clone and Revenge of the Sith. Therein, Yoda has a chat with a group of clones. He reminds them that they all have an individual existence. Despite being genetic copies of Jango Fett, they are people whose sacrifices have meaning. With the force reduced to space parasites, I didn’t think “second trilogy” stories were capable of dipping even a toe into the metaphysical pond. What put me off season one was Anakin Skywalker’s “I want General Grievous, but once again I’ve missed capturing him by a hair’s breadth” adventures. Of course Anakin’s not going to catch him. Every story that dealt with capturing the General became a throwaway. Despite some cool space battles that included pre-AT-ATs deployed on asteroids to act as fire support for Republic ships in a pitched battle against the Separatists, I didn’t feel compelled to watch season two. On Saturday night, The Clone Wars managed to keep me up until 2:30am with a four-episode story arc that’s got me thinking I should give this series a re-watch. The season four episodes Darkness on Umbara, The General, Plan of Dissent, and Carnage of Krell (all written by Matt Michnovetz) tell a story that feels like an honest to god war story. The quick summary is this: for one reason or another Anakin has to surrender control of his troops to General Krell. Krell is every solider’s worst nightmare, a leader who puts objectives before the welfare of his men. Spoiler alert: many clones die in this episode. In one particular scene I saw no less than thirty clones get vaporized. Seriously, people are actually dying in a Star Wars thing? Lucas won’t let Han shoot first, but somehow his name is attached to a show that deals with the sort of military issues that were common fare on M*A*S*H*? Things get so bad for the battle hardened clones that a number of them outwardly begin planning a rebellion against Krell. And again, the story takes a turn for the metaphysical. Perhaps it’s a cliché of war stories to hear soldiers talking about their right to refuse orders they know are wrong, but seeing Captain Rex torn between his genetically programmed instinct to obey and his practical knowledge gained through battle experience is a sight to behold. There are also the little things that make the episode so emotionally charged. 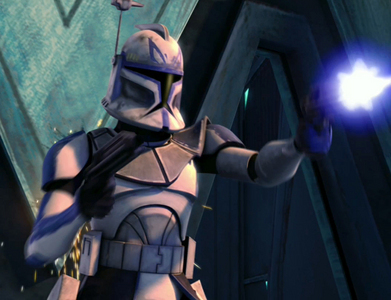 The clones all have nick names for each other; CT-5555 is known to his friends as “fives”. Yet Krell refuses to refer to his men as anything other than their serial numbers. I’ll even go out on a limb to say that this one story arc has made the clones tragic figures in my mind. Anakin’s fall from grace is his own doing. But these clones, men who fought and died for the Republic, men who came to believe in the Republic through sacrifice, are going to have all of that stripped away from them with order 66. It’s one thing to kill a soldier in a story. Stripping that same soldier of his honour and individual agency, that’s something much more profound. I’m left with one final question: if I go back and watch season two and three, will I find more episodes like this? Was this a one off? Or did Dave Filoni finally manage to kick Lucas out of the writer’s room? I’ll throw it out to you guys for your thoughts on this point. Go give it a chance. The last two episodes of Season 3 have a “surprise” guest appearance, but the story is a descent from ideals to doing what it takes to survive. Brutal, horrifying—you think they won’t go there, it’s a cartoon. And they go there. But it is still safe for an 8 year old. Top notch storytelling. It does make you wonder what would have happened it Lucas had been tossed out as writer and this writing team had been allowed to craft the prequels. I think I can begin where Matt left off…I like to look at Clone Wars as what the prequels *should* have been. Much of what Filoni did was rather subversive of what had been established by the prequels. I don’t think he gift lies in going behind Lucas’ back, but in what he manages to pull off with Lucas’ ascent. Despite the clones being presented as scene filler and little more than a plot device in the prequel films, the Clone Wars went out of their way to demonstrate individuality amongst them and to give them just a little more humanity: The scene from the first broadcast episode (as Adam mentioned), the first battle in the theatrical movie that treated the clones like the allied troops in Saving Private Ryan, or when Plo Kloon tells his platoon of troops who believe they’ve been given up on that getting them out alive is more important than any mission objective. I found myself liking the series despite myself, perhaps because was closer to what the 14 year old me pictured what the prequels would be like. Also, however corny and contrived the show was at times, it was far more entertaining than any of the prequel movies and the half-hour time seemed to be more ideal for serial type stories. And I could watch it with my (then) five year old. So there. Of course, then came the third season and suddenly I found the plots were trying to be a little more topical. I put the series “on notice” after a two episode arc where the plot centred on the senate voting down financial regulations put the series. The follow up to this was the “big mystery of the force” arc (the “Mortis” episodes) that Lucas had apparently dumped in the writer’s room for them to sort out. Clone Wars works best when it ignores the convoluted mysticism and prophecy about Anakin and his and just focuses on letting him wear the white hat and blow up robots. So, I am happy to say that after looking at this arc that the show did not entirely jump the shark as I’d feared. It played out with some of the action sequences the show does well, the first episode right up there with “Landing at Point Rain” (which is the best example of the show doing a 22 minute long action sequence with little to no plot but still manages to be engaging) and then the drama with Krell took over the rest of the story. I find myself wondering if it would have worked better if it had been played down a bit and more nuanced. For instance, if Krell had not been an outright traitor but just careless about casualties to the point he might as well have been, but then I remembered about how the show works best when things are kept simple–and they got there. I’ll have to go back and watch some more of these. Thanks for the review!